What is the Intel NUC? Intel’s Next Unit of Computing (NUC) is an ultra-compact motherboard form factor measuring a mere 4 x 4 inches, but with the power and performance capabilities of larger, more traditional tower PCs. Ideal for space-constrained multimedia applications, Intel NUC motherboards feature Intel Core i3/i5 and Celeron processors, giving them the ability to handle graphic-intensive tasks with ease. Their small size make Intel NUC motherboards an extremely versatile option, suited to a wide range of consumer home entertainment and HTPC applications, as well as commercial digital signage, workstation and industrial installations. The Mini-ITX form factor was a revolution in compact, high performance computing. Now Intel’s Next Unit of Computing takes that idea a step further. Intel NUC motherboards offer all of the functionality of much larger computers in an ultra-small, easy to integrate design perfect for embedded and industrial applications where space is at a premium. Mini PCs aren’t traditionally renowned for their performance capabilities, but the latest generation Core i3 and i5 Haswell processors make Intel NUC motherboards a perfect fit for many industrial digital signage and multi-media display applications. Onboard Intel HD graphics give NUC systems the flexibility to accommodate even the most image-intensive and video processing tasks. While many NUC enclosures rely on integrated fans to allow for proper system cooling, Logic Supply also offers Intel NUC motherboards in innovative fanless cases. Even during write-intensive operations, single-interface heatsink technology and carefully engineered airflow designs give users the option to go fanless, allowing for completely silent and reliable operation. 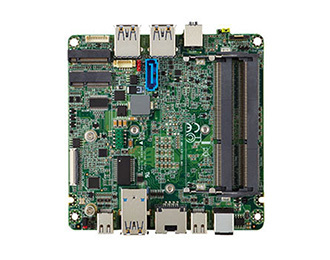 NUC motherboards already offer a range of connectivity options designed to provide the most common consumer I/O capabilities, but at Logic Supply we’ve designed many of our Intel NUC enclosures to accommodate the industrial I/O options, like RS-232 COM ports, that embedded commercial applications require. Unlike many of the other commercially available NUC-based systems, Logic Supply offers completely fanless and fully sealed NUC cases. Able to protect internal components from metal shavings, dust or other debris common in an industrial setting, our state-of-the-art case designs let you install a NUC PC virtually anywhere. Specially-engineered heatsink technology prevents overheating while eliminating the potential failure point of internal fans.